This answer is a thing of beauty. I want to share it far and wide, but I can't figure out how to link directly to the snippet in full screen mode. The helpful "Expand Snippet" button is great and pretty much exactly what I want, but it doesn't put a direct URL in the address bar. Is it possible to link directly to a running code snippet, preferably in full screen or a stand-alone editor like https://codepen.io/pen/ or https://jsfiddle.net/? Right now, no. There is not even a way to generate a link directly to the snippet either. The results of a snipped are hosted inside an <iframe>, but there is no fixed url based on any identifiable information. Clicking the run button just transmits your code to https://stacksnippets.net/js as a POST call. The service doesn't generate a unique url for your snippet, so you're out of luck unless you want to re-send all of the source code. Not the answer you're looking for? 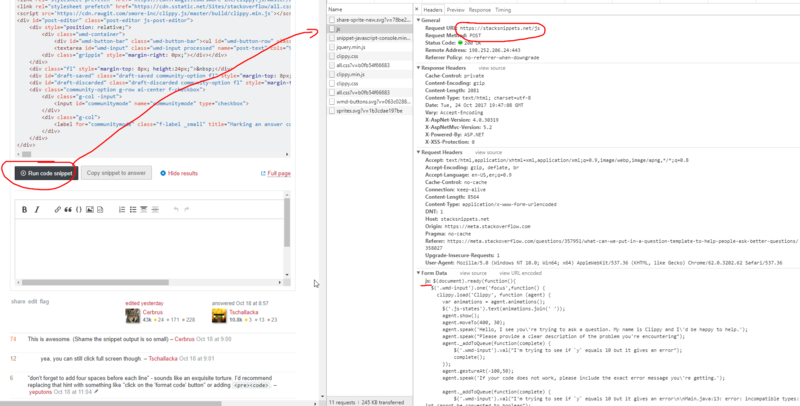 Browse other questions tagged feature-request stack-snippets code .